Major upgrades to the Lonsdale Quay bus loop on the North Vancouver waterfront will commence in March. TransLink says the upgrades to the bus exchange, which is below the ICBC headquarters building and serves the SeaBus terminal, will include a new layout to accommodate the new North Shore B-Line and improve vehicle and pedestrian flow. The new layout will provide additional capacity for the new ridership generated by the new B-Line, more frequent regular bus route services, peak hour SeaBus frequencies of every 10 minutes starting later this year, and the growing density and attractions in the Lonsdale area. 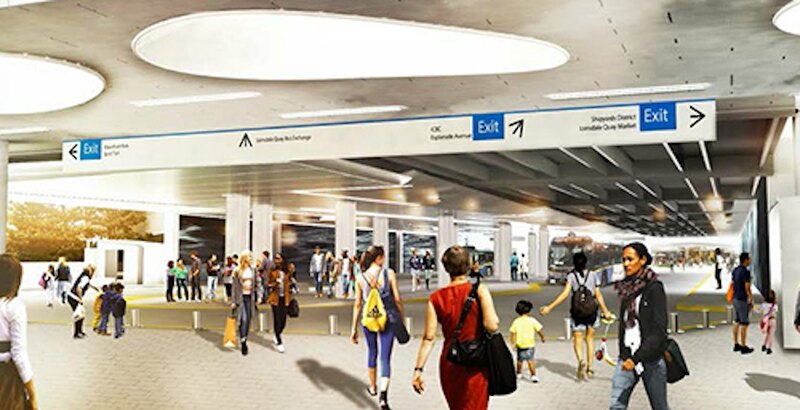 Other improvements consist of an updated design with more lighting and a public art installation, a new canopy over the passenger hub outside the SeaBus fare gates, and a replacement of the existing pavement throughout the entire transit hub. The transit hub sees an average of over 8,000 bus passenger movements per weekday, on top of over 17,000 daily SeaBus boardings. About a dozen bus routes serve the bus loop, which is the second busiest bus exchange on the North Shore. During the construction period, some bus stops will be temporarily relocated and some routes will be altered. Construction is slated for completion in late 2019. The public transit authority plans on launching the new North Shore B-Line in the fall of this year, coinciding with the launch of two other new B-Line routes elsewhere in the region. Upgrades were also recently performed on the Lonsdale Quay SeaBus terminal and maintenance facility, and a $17-million project to improve and expand the Waterfront Station SeaBus terminal is currently ongoing. As well, construction is expected to begin this year on the upgrade of Phibbs Exchange located near the northern end of the Ironworkers Memorial Bridge. Editor’s note: This article has been updated to reflect the updated construction schedule of the noted upgrade projects.